Amy J. Radin is a nationally recognized Fortune 100 Chief Marketing and Innovation Officer, advisor and investor, board member, and thought leader on how to deliver innovation for sustainable, business-changing impact. She has been at the forefront of rewiring brands for growth, and now applies her expertise working with executives to reduce the uncertainty, ambiguity and uncertainty, and realize the benefits of innovation. She built a track record of success moving ideas to performance at Citi, American Express, E*TRADE and AXA. 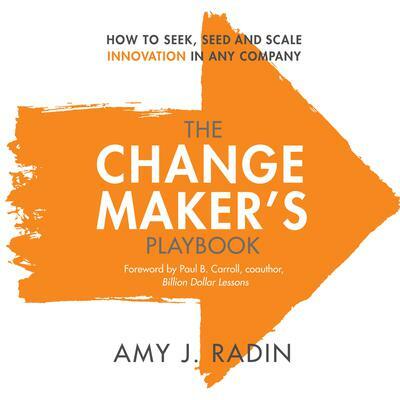 The Change Maker’s Playbook: How to Seek, Seed and Scale Innovation in Any Company is Amy’s first book and captures her field-tested experience as the top executive accountable for achieving innovation results under varied, complex and rapidly changing conditions. Amy is a graduate of The Wharton School and Wesleyan University. She serves on the Board of the AICPA where she is advising on marketing strategy and the impact of technology and workforce disruption on accounting and financial advisory services for 650,000 member professionals across the globe. She established and sponsors an annual social impact fellowship at the NYU Stern Graduate School of Business, benefitting students, not-for-profits and government agencies in the New York metro community for over a decade.